At Naankuse Lodge we offer a variety of unique activities for guests to enjoy. 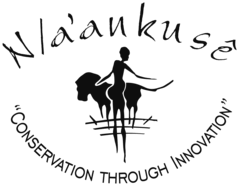 These activities are eco-friendly, give you a chance to learn about our animals, meet the people of Naankuse (and Namibia), and contribute to our conservation efforts. Book yourself onto any of the following activities and have a wonderful experience while giving back to vital conservation efforts. Lodge and day guests have the opportunity to take part in our various activities. If you are not staying at the lodge but would like to book an activity please contact activities@naankuse.com or call us on +264 (0)61 307 338 (select option 2 for Activity Centre). Lodge guests can book directly with the lodge via lodge@naankuse.com. Follow in Marlice’s footsteps and get an intimate view of the workings of a wildlife reserve and sanctuary. During this activity you will gain insight into the real Naankuse world and the inner workings of sanctuary life and the myriad of animal species currently being cared for. You will enter the riveting world of research carried out at Naankuse, and gain intimate knowledge into the field of human – carnivore conflict mitigation. Become smitten with our gorgeous sanctuary orphans and bond with the baby baboons (there’s nothing like it). Please book at least 2 weeks in advance, but do keep in mind that this depends on Marlice’s availability. A cancellation fee of 100% will apply if cancelled 24 hours or less prior to tour begin. The tour begins with breakfast at the lodge at 07:00 and can last between four and six hours. Carnivore feeding tours take place daily at 10:00 and 15:00, with a minimum of one person. We ask that you book at least one day in advance. This academy is a joint venture between the Naankuse Foundation and the Nyae Nyae Conservancy. It aims to serve as a reciprocal training venture where visiting San groups from the Nyae Nyae Conservancy stay at Naankuse to display their cultural heritage and skills to visitors. 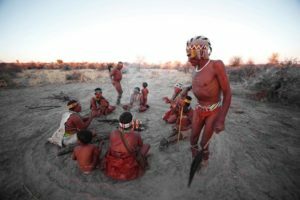 Take the opportunity to visit the San Bushmen in their traditional village and witness their ancient culture and traditions first hand. The San will show you plants they use for medicinal purposes, how they make fire and set traps, tell you how they hunt and regale you with stories, song and dance. Tours occur daily at 10:00 and 15:00 with a minimum of two people for this child-friendly activity. Our nature guide will take you to the N/a’an ku sê Ancient San Skills Academy, where you will join the San Bushmen around their evening fire and listen to their traditional stories about the stars, animals, galaxies and the universe. This activity departs from the lodge at 19:15. Experience the magic of the Namibian nights on this once-in-a-lifetime activity. 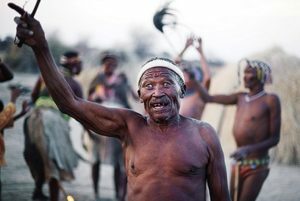 Join the San Bushmen and spend the night immersed in their traditions. Become part of their world and witness song and dance that echoes underneath a canopy of stars. Their mythical stories will keep you intrigued. Follow in the footsteps of San Bushman hunters! 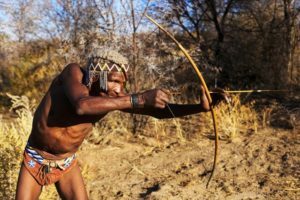 Learn about tracking and hunting and, of course, any meat obtained (if it’s a lucky hunting day) goes back to the San Bushman community. Habituated cheetahs have lost their fear of humans – a fear that is crucial in elevating their survival chances in the wild. For this reason, some of the magnificent spotted sprinters at Naankuse need to remain in captivity, having come to the sanctuary from various conflict situations at very young ages. At Naankuse we fully nurture and encourage their natural behaviour, captivity resembling the life of their wild counterparts as closely as possible. Enjoy time with our habituated big cats, in the hands of an experienced and knowledgeable guide. Simply not to be missed! This activity leaves the lodge every morning at 08:00; lasts approximately two hours. We advise booking at least one day in advance. Minimum participants: 2 (Sorry, no children allowed). PHOTOGRAPHS OF THE CHEETAHS ONLY PERMITTED. Take a walk with our habituated caracal in the expert hands of one of our guides. On this walk you will get to see how these magnificent animals behave in the wild, stalking birds and small mammals as they regain their natural instincts and hone their hunting skills. You will also experience the serenity of the Namibian bush veldt, and no doubt be accompanied by a wide variety of bird species. Caracal walks start every morning at 08:00, last approximately 90 minutes and are not child-friendly. We advise booking at least one day in advance. Meet our playful primates and experience the joys of monkey fun on a not–to–be–missed baboon walk. All of our baboons came to Naankuse either after losing their mums (Namibia’s Chacma baboons are tragically persecuted on an almost daily basis), or having been rescued from situations of abuse. Our baboon buddies adore the interaction and bounding through the bush on their daily walks. Why not join in and get to know firsthand just how incredible these animals are? When: Every morning Monday to Saturday. Check with reception for departure time. Approximately 2 hours; no children allowed. Experience the wonders of our wildlife from a saddle! There’s nothing quite like it. A two-hour horse ride through the bush will give intermediate and advanced riders the unique chance to observe our wild game closer than ever before – and you may even be lucky enough to ride among our gorgeous giraffe family. Our experienced coordinator will provide you with all of the necessary safety equipment and will guide you on a fabulous afternoon. This five-kilometer guided walk is an excellent way to experience the bush veldt on the Naankuse Reserve. Spot different bird species including the African hoopoe, lilac breasted rollers, the grey go-away bird, kori bustards and many more. You may also spot warthogs, a variety of antelope or black-backed jackal along the way. This is a fantastic tour for bird lovers! This tour takes place daily at 16:00 and takes approximately two hours. 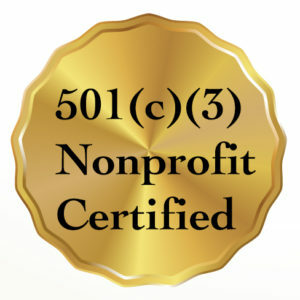 It has a minimum of one participant. Please book at least one day in advance. The perfect way to end another fabulous day at Naankuse Lodge and Wildlife Sanctuary. Enjoy a bush drive with our experienced guides, before stopping off at a hidden sunset viewing deck where drinks will be served. Lose yourself in our incredible Namibian sunset, and then keep an eye out for our nocturnal animal friends on your leisurely drive back to the lodge.